the Nogob (previously Fik), Jarar (previously Degehabur), Shabelle (previously Gode), Korahe and Dollo (previously Warder) zones of the Somali region. In mid-April 2016 there were severe floods in parts of Ethiopia including Jijiga, the Jinka road in South Omo, Moyale on the Kenyan border, and parts of the Afar region. Check local reports for areas you intend to visit before travelling. There were reports of a hand grenade attack in Debre Zeit on Wednesday 30 March 2016. Check local reports before travelling to this area. Widespread protests have occurred across the Oromia region in recent weeks; some have turned violent resulting in casualties and others have caused disruption to road travel. There is a heightened risk of travel across the region. You should very carefully check the latest security situation on the ground before travelling, and review your plans accordingly. On Saturday 12 March there were reports of clashes that lead to the Konso authorities blocking the road leading to Yabelo and Jinka regions. Police have advised people not to travel until the issue is resolved and the road reopened. You should take extra care if you’re planning to travel within this region. On the weekend of 13 to 14 February, there was a further serious outbreak of violence in the Shashemene and Langano areas, a few hours drive south of Addis Ababa. There have been wide spread clashes with local authorities and reports of vehicles being attacked. In late January and early February 2016, ethnic tensions in Gambella city and surrounding areas have resulted in a number of casualties. Federal authorities have been deployed and a curfew imposed. The FCO already advise against all travel in 4 woredas of the Gambella region and against all but essential travel in a further 3. You should monitor local news media for further information before travelling, remain vigilant and take care in crowded areas. There have been heavy clashes including gunfire between protesters and security forces on 17 December 2015 in Sululta, 20km north of Addis Ababa on the road to Bahir Dar. Localised clashes in the Galabat area resulted in the closure of the Metema-Galabat border post with Sudan on 15 and 16 December 2015 and further crossing point closures may occur. There was an explosion at the Anwar Mosque in the Merkato area of central Addis Ababa on 11 December 2015. There is a high threat from terrorism. There are credible reports that Al Shabaab plan, and have the capability, to attack targets in Ethiopia. 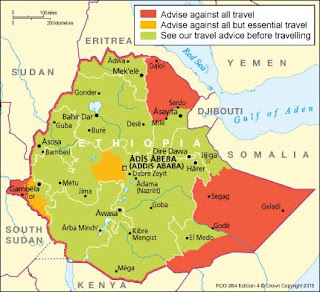 In October 2014 the US Embassy in Addis Ababa issued a travel warning advising “those in Addis Ababa to avoid areas where both Ethiopians and westerners frequent”, and citing threat reports of Al Shabaab’s intent to target the Bole area of the city. Around 20,000 British nationals visit Ethiopia every year. Most visits are trouble free.